Our little homestead is located in a suburban subdivision in southeastern Michigan. That basically means we have a short growing season and barely anywhere ideal to plant a conventional garden. Most of our backyard is taken up by our pool and the septic field. Sooooooo, raised beds it is. But even better than that, square foot raised garden beds. Why, you ask? Here is some information that caught our attention and sold us on the idea to be square foot farmers. Square Foot Gardening is very intensive. You can plant more veggies in a smaller space than in a conventional garden. There is also little weeding (yay!) and because the special soil mixure retains water extremely well, we have less of a chance of killing our plants (we need all the help we can get). 1. 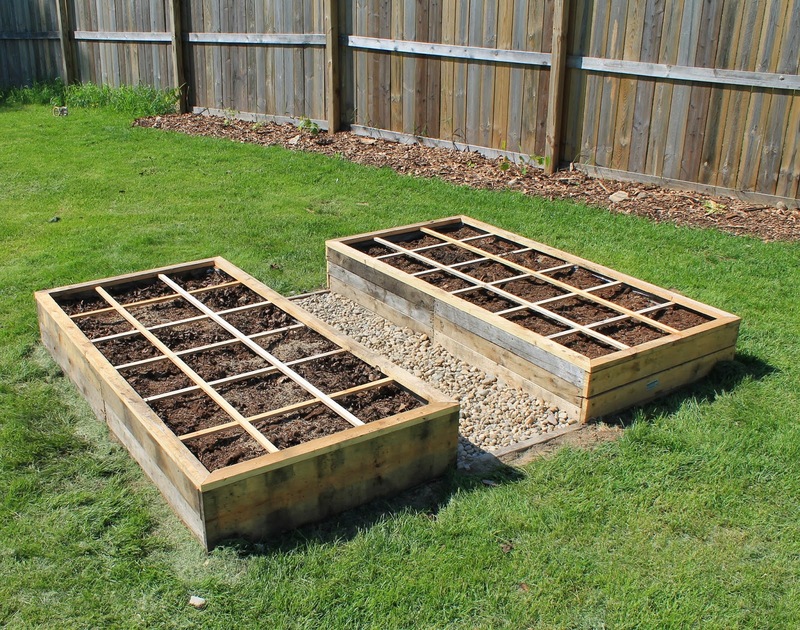 Raised Beds: Garden box frames should be no wider than 4 feet x any length, and 6 to 8 inches deep. We opted for 3 x 6 raised beds. Todd built ours using free pallet wood, click here to learn more about that process. 1 foot by 1 foot grid and must be permanent. On top of each frame place a permanent grid that divides the box into one foot squares. The grid is the unique feature that makes the whole system work so well. 4: Plant Spacing: Depending on the mature size of the plant, grow 1, 4, 9, or 16 equally spaced plants per square foot. Choose fruits and veggies that make sense for your family and for the intensive planting style of the Square Foot Garden. Here is a great resource for knowing how many plants to plant per square. Numbers will vary slightly depending on which website you use. 1. Plan out your garden first on paper. I planned out our two beds on this piece of paper. 2. Start your seeds indoors, especially if you have a short growing season. We also got a great jump-start on our tomato plants by using the cloned clippings from the plants in our aquaponics beds. We started out with plants almost two feet tall! Learn all about that easy process here. Best way to start tomatoes in my opinion! 3. Plant the tallest plants on the north side of your square foot garden beds, especially the veggies that need trellises or supports to grow. This helps the shorter plants get all the sun they can. 4. And here is the most important tip, the tip I read and forgot about, and did not follow. So please don't be like me. Water your soil BEFORE you plant your seeds! I know that's a good idea in any garden, but this soil mixture is the thirstiest, spongiest soil you could ever hope for. It took me FOREVER to water after I planted, especially since I didn't want to wash away the fragile plants I had just planted.